The U.S. Trade and Development Agency has commended the management of Eko Petrochemical and Refining Company Limited for the level of work done so far, assuring of its continuous and total support. 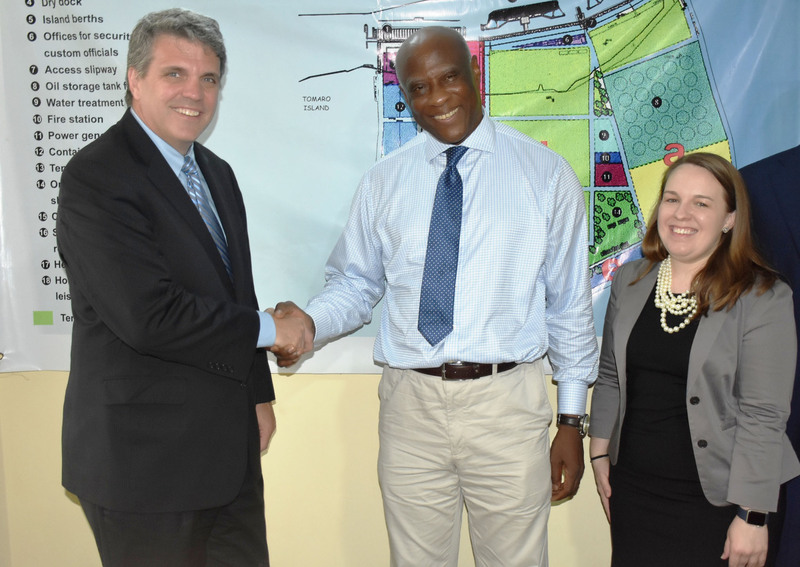 USTDA’s Acting Director, Mr. Thomas Hardy gave the commendation during a project inspection of the 20, 000 barrel per day production capacity modular refinery located at Tomaro Island Port in Amuwo – Odofin Local Government Area of Lagos. According to Hardy, the agency is impressed with the level of activities done so far on the project. Hardy explained that in 2017, USTDA invested in the engineering design of Eko Petrochemical Refinery Project on Tomaro Island forward, to make the vision of Capt. Iheanacho actualised and a reality. “The idea is bringing jobs into the Nigerian economy by expanding the petro-chemical industry in the country. Generally, strengthening the Nigerian economy became paramount to the success of this project,”he added. Hardy said that the move by the US government was also to see a closer bilateral co-operation between the United State and Nigeria. “Most importantly, invest in private companies and leaders in the business community. They can move the project to generate jobs and growth in the Nigerian economy. I am impressed with what I saw. When we got involved in the very early stage, we knew that there was going to be hurdles. So, we decided to invest and bring technical experts into Nigeria to help Iheanacho lay forth the plan he needed to move forward to get the finance to move this project for implementation. This is exactly what we intended to do. Our investment is going to be making those connections to finance the sea contracts. Anything that can help him achieves his vision for Nigeria and growth of Tomaro Island is our goal right now,” Hardy said. Ms Shannon Roe, the Country Manager, Sub-Saharan Africa, USTDA said the agency decided to visit the refinery, adding that it was geared toward creating value and ease reefing project in Nigeria. Roe said one of the reasons why the agency came for inspection was to see the level of activities that have taken place since the last time we came in 2017. She also expressed the hope that the proposed 200, 000 bpd production refinery would attract more investments to the country and develop the host communities. “The grant in 2017 was meant for detailed engineering design and development of the proposed refinery in Tomaro Industrial Park in Lagos. I feel honoured to be part of the success story. I also promise to support the projects to actualiasation,’’ she said. Capt. Ememnuel Iheanacho, Chairman, Eko Petrochemical Refinery Company,in his remarks lauded the USTDA’s support to the growth of the refinery. Iheanacho said the agency had the mandate to help local companies and trading entities to develop contact with their equivalent counterpart in America. He said that the company had completed the planning stage, completed drawing-up of the feasibility map and the detailed work-front engineering which met both the Department of Petroleum Resources’ and America’s specifications. The refiner said that DPR had given the approval authority to construct, adding that “in the scheme of our current national priorities, the requirement to develop indigenous refining capacity on Nigerian soil is very high indeed. “Local refining capacity will allow us realise our ambitions with respect to import substitution potential, leading to great savings in scarce forex requirements. Local refiners will facilitate the goals of value addition to our oil trade as well as lead to lower costs of consumed refined products in the country. We intend to have recourse to traditional and special funding sources in our search for investment funds for our refinery development project,’’ Iheanacho said. He said that 120 millionUS dollars was expected to complete the refinery, adding that they were awaiting some companies that had shown interest in financing the project and handling the Engineering Procurement and Construction (EPC). The chairman said that the company would soon embark on the construction of the crude distillation unit which cost about 32 million US dollars while it continues to look for funds to do the civil and all other engineering structures associated with the refinery. “The fabrication will cost us 32 million dollars which will take us about 6 to 7 months and art of the refinery would be ready. We appeal to Nigeria Government for support toward actualisation of the refinery, we want to say to government that what we are doing is absolutely unique and to tell them to try and understand the sacrifices we are making. This is not about making money but to realise that Nigeria must move away from being net consumers to being refiners of the product; to build people who can refine their crude and export and to generate more jobs for ourselves. It will also ease transfer of technology to our people and reduce the cost of energy consumed in the country. l wish the government will be able to make a distinction pioneers and traders who are trading and making profit". The community representative, Chief Lamina Akinsode, said that the 24-communities comprising of the Tomoro Island supported the citing of the refinery on their land. Akinsode said that would bring development and empowerment to their communities. The Opeluwa of Olusiwo Kingdom urged the USTDA to continually support the project to completion stage for the growth and betterment of their communities. Akinsode said he believed that once the project was completed, many youths in the community would be employed. It would be recalled that in 2017, the U.S. Trade and Development Agency approved a grant of $1m (N360m) for the detailed engineering design of 20,000 barrel per day Eko Petrochemical modular refinery in Lagos.